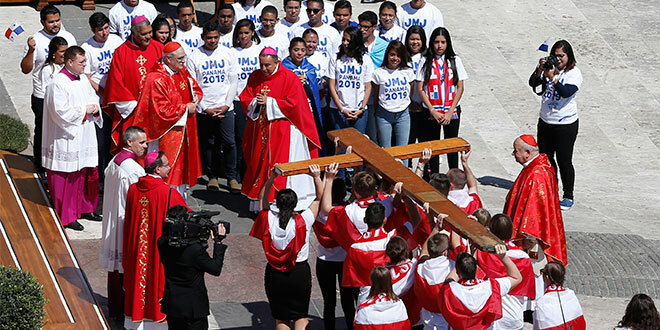 WYD: Youths from Poland present the World Youth Day cross to young representatives from Panama, where the next international gathering will be held in January 2019, at the conclusion of Palm Sunday Mass celebrated by Pope Francis in St Peter’s Square on April 9. Photo: CNS. As one of the few young people at my parish, I could count on one hand the total number of other teenagers at Mass on Sundays. The idea that I would someday celebrate my Catholic faith with thousands of other young people, seemed to be a bit of a stretch of the imagination. But this is what I experienced in Sydney in 2008 at my first international gathering of young Catholics called World Youth Day. In a brief moment, as I stood amongst thousands of young people at the opening Mass, I discovered that I was far from being the only young person in the Catholic Church who had a passion and a desire to live out my Catholic faith in a real and practical way. World Youth Days are unique experiences that allow young Catholics from around the world to come together and celebrate their faith with joy and enthusiasm. During World Youth Day week, pilgrims are invited to step out of their comfort zone and meet like-minded people from various cultures and backgrounds. Bishops and cardinals from different parts of the world provide excellent catechesis, breaking open the Word and encouraging deeper reflection on important issues in the Church. Pope Francis has invited the youth of the world to participate in the 34th World Youth Day in Panama City, Panama from January 22-27 in 2019. The theme, “I am the servant of the Lord. May it be done to me according to your Word” (Luke 1:38), focuses on Mary as the perfect model for how Catholics should respond to the call God places in our hearts, with complete surrender and trust in His will. This is the first time World Youth Day will be held in Central America since its introduction by Pope John Paul II in 1987. As a Jesuit and Latin American pope, Pope Francis sees it beneficial to invite young people to enrich their faith through an immersion experience of the Church in Central America. Panama City has a population of about 880,700. It is a largely Christian country with 85 per cent of the population identifying as Catholic and 15 per cent as Protestant. Spanish is mainly spoken in Panama and the Spanish culture provides a colourful experience with its exotic food, culture and people. The weather in Central America is tropical and, with the event being hosted in January, this will be its dry season where temperatures will vary from 24 to 29 degrees Celsius. As the Archdiocese of Brisbane’s World Youth Day co-ordinator for Panama 2019, I echo Pope Francis’ message and invite you to join me on this adventure. I encourage you to invite other young Catholics aged 18 and above to consider coming along for the ride. This event may be the catalyst that opens a young person’s eyes to a Church that is truly alive in joy and inspires them to participate fully in real and practical ways in their own local parish. Register your expression of interest on wydbrisbane.org.au, to receive the latest information available regarding Brisbane’s pilgrimage to World Youth Day Panama 2019. 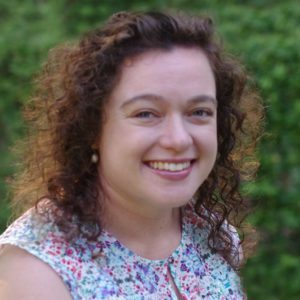 Melissa Fenech is the Coordinator for the Brisbane pilgrimage to WYD2019, a project of the Brisbane archdiocese’s Youth Evangelisation Office.